To evaluate the outcomes of primary topography-guided laser in situ keratomileusis (LASIK) in eyes with subjective refractive astigmatism of 2.00 diopters (D) or greater. This was a prospective study in consecutive eyes with cylinder of 2.00 D or greater that had LASIK using the Alcon WaveLight EX500 excimer laser and T-CAT/Contoura software (Alcon Laboratories, Inc., Fort Worth, TX). The accuracy, efficacy, safety, cylinder vector analysis, higher order aberrations, and patients' subjective quality of vision were assessed. Eyes with naturally occurring topographic irregular astigmatism were not excluded. The mean cylinder was −2.55 D preoperatively and −0.34 D postoperatively; 81% and 95% of eyes were within ±0.50 and ±0.75 D of intended cylinder after LASIK, respectively. The correction index and index of success were 1.00 and 0.13, respectively. The efficacy and safety indexes were 0.98 and 1.04, respectively. The preoperative corneal topography irregularity index, anterior corneal higher order aberrations, and refractive astigmatism magnitude were mildly correlated to postoperative residual astigmatism. Mean ocular and corneal coma were not increased postoperatively. Patients had significant improvements after LASIK in both subjective uncorrected quality of vision and night vision disturbances compared to spectacle- and contact lens–corrected vision before LASIK. Topography-guided ablation using the Alcon WaveLight EX500 excimer laser and T-CAT/Contoura software results in excellent accuracy, efficacy, and safety, with improved postoperative subjective quality of vision and reduced night vision disturbances in virgin eyes with refractive astigmatism of 2.00 D or greater, including eyes with topographic naturally occurring irregular astigmatism. Topography-guided excimer ablation uses high-resolution corneal topographic height maps to generate a customized ablation profile consisting of anterior corneal higher order aberrations (HOAs) and an accurate measure of the anterior corneal astigmatism (ACA). Topography-guided custom ablation treatment (T-CAT, now called Contoura) (Alcon Laboratories, Inc., Fort Worth, TX; Contoura in the United States) has been approved by the U.S. Food and Drug Administration (FDA) for primary laser in situ keratomileusis (LASIK) in myopic and myopic astigmatism eyes, with resulting good efficacy and safety.1 However, this trial and its subsequent publication excluded eyes with naturally occurring irregular astigmatism. Healthy corneas with skewed radial axes, non-orthogonal cylinder, and asymmetric bowties were excluded to standardize the preoperative cohort, maximize outcomes, and avoid refractive surprises.1,2 T-CAT refractive predictability can be a concern with increasing corneal irregularities and elevated anterior corneal HOAs.3 Eyes with greater cylinder magnitude, particularly those with irregular astigmatism, have more anterior corneal HOAs.4,5 They also have a greater discrepancy between subjective refractive astigmatism and topography-measured ACA,6 which can also lead to lesser outcomes.7,8 This prospective study therefore set out to report on visual and refractive outcomes in eyes with manifest refractive astigmatism of 2.00 diopters (D) or greater undergoing T-CAT, including eyes with naturally occurring irregular astigmatism. HOA data, subjective quality of vision, and patient satisfaction are also reported. This was a prospective cohort study in two Canadian refractive surgery clinics. Consecutive patients with subjective manifest refraction cylinder of 2.00 D or greater of myopic astigmatism were screened to enter the study. Eyes with naturally occurring irregular astigmatism, such as mild topographic asymmetric bowties and skewed radial axes, were not excluded unless keratoconus or forme fruste keratoconus was suspected. Other standard inclusion criteria for laser vision correction were required, including adequate corneal tissue, no previous ocular surgery or disease, no systemic disease that could affect corneal healing, no visually significant lens changes or macular disease, and age older than 18 years. Recruitment stopped after 100 consecutive eyes were enrolled. All procedures fulfilled the principles of the Declaration of Helsinki, and the study was approved by the Ethics Review Board of the Canadian Ophthalmic Research Centre. All patients provided a written informed consent for use of their anonymized data for research. Between four and eight corneal topographies were acquired on undilated eyes with the WaveLight Topolyzer VARIO (Alcon Laboratories, Inc.). Images were reviewed for quality. Criteria for acceptance included appropriate recognition of the pupil and the mire edge by the software, mires with minimal breaks, the absence of significant missing data (shadow from the eyelids, eyelashes, nose, or dry tear film), a percentage of data obtained (analyzed area) greater than 70% and greater than 90% in the 6.5-mm zone, and a low median of absolute deviation variability score below 0.10. The median of absolute deviation score is the median of the absolute value of the difference between all actual scan values and their average value. A median of absolute deviation score of 0.10 indicates that all scans are highly reproducible. Maps were viewed in the raw data sagittal setting and compared in the compare examinations display to assess the reproducibility of the data including keratometry, Q-value, and axis of astigmatism. Images that did not meet the criteria were excluded. The remaining images were exported to the T-CAT software to generate the ablation profiles. Scans were repeated if a minimum of four were not accepted. The planned ablation profiles were then examined with sphere and cylinder set to zero, showing only the anterior corneal HOA ablation profile. The HOA pattern was verified to be consistent with anterior elevation topography with no artifacts affecting the ablation pattern. Eyes with scans that did not match appropriately were eliminated from the study. Six experienced surgeons followed the same previously described standardized techniques.9 The IntraLase femtosecond laser iFS (Abbott Medical Optics, Inc., Santa Clara, CA) or Z16 or Z18 Hansatome Microkeratome (Bausch & Lomb, Rochester, NY) in combination with an 8.5- or 9.5-mm suction ring were used to create the corneal flaps. The WaveLight EX500 excimer laser with T-CAT software was used for excimer ablation. Manifest refraction was the treatment input parameter for the T-CAT software, without using the measured ACA data from the VARIO scans. No eyes were excluded based on the discrepancy between their subjective refractive astigmatism and topography-measured ACA cylinder axis or magnitude. No target Q-value adjustments were made. A target of emmetropia was set for all patients. A modified version of the Alcon WaveLight nomogram was used. The ablation was autocentered on the corneal vertex by the T-CAT software. A standardized postoperative regimen9 of antibiotics and steroids was used. Ophthalmic examinations were performed preoperatively and at 1 day, 1 week, 1 month, and 3 months postoperatively. Data collected included manifest spherical refraction, manifest cylindrical refraction, manifest spherical equivalent (SEQ), Snellen uncorrected and corrected distance visual acuity (UDVA and CDVA), maximum keratometry and corneal irregularity (Orbscan IIz system; Bausch & Lomb), central corneal thickness (handheld ultrasound pachymetry; Sonogage Inc., Cleveland, OH), corneal topography (WaveLight Topolyzer VARIO, 6.5-mm zone), and ocular aberrometry HOA (Zywave; Bausch & Lomb, 6-mm zone). Preoperative and postoperative measurements were performed with the same devices for each patient. All patients completed a standardized questionnaire measuring their subjective quality of vision and satisfaction, based on the McAlinden et al.10 validated survey, before and 3 months after LASIK. Patients who missed follow-up appointments were excluded from the analysis. Standard graphs as defined by the Journal of Refractive Surgery11 were produced. Astigmatism correction was assessed using the Alpins vector analysis method.11,12 Alpins' correction index (CI) and index of success (IOS) were reported as geometric means. 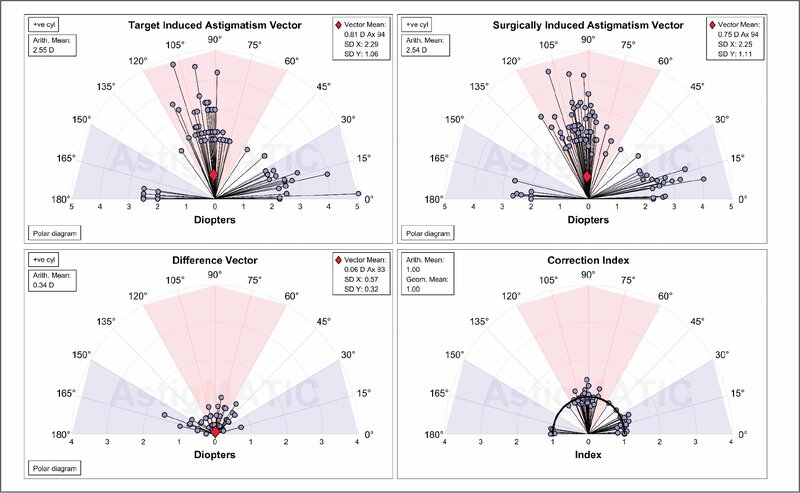 Standard Alpins' vector graphs were produced with the AstigMATIC software.13 Ocular residual astigmatism (ORA) was derived using the vectorial difference between the subjective refractive astigmatism and the Contoura-measured ACA. Statistical analyses were calculated using MATLAB R2018a software (Mathworks, Natick, MA).13 Paired sample t tests were used. Statistical significance was set at a P value less than .05 and all data were reported as means ± standard deviations. A total of 100 eyes were enrolled from 65 patients. Twenty eyes were excluded from the study due to missing data and/or follow-up visits. Four eyes with arte-factual or low-quality corneal topography (WaveLight Topolyzer VARIO) were excluded. The resultant 76 eyes from 49 patients were included for analysis. The mean patient age was 30 ± 7.55 years (range: 18 to 51 years). The median time interval between surgery and the last follow-up was 3.2 months (range: 2 to 6 months). The preoperative and postoperative refractive variables are reported in Table 1. The preoperative keratometric axial topographic maps presented with various orientations, power, and varying levels of regular and naturally occurring irregular astigmatism (Figure A, available in the online version of this article). The ACA was with-the-rule in 51 eyes (67%), against-the-rule in 22 eyes (29%), and oblique in 3 eyes (4%). The average angle of deviation of skewed radial axes was 8.02° ± 6.29°, and 28 eyes (37%) had skewed radial axes with an angle of deviation between 10° and 24°. The ACA magnitude, measured by the T-CAT software, ranged between −0.48 and −4.42 D, with an average of −2.44 ± 0.95 D. The magnitude discrepancy between refractive astigmatism and ACA ranged between −2.16 and +1.73 D, with an absolute average of 0.70 ± 0.48 D. The axis discrepancy ranged between 0° and 27°, with an average of 4.93 ± 5.19 D. The average vectorial ORA was −0.86 ± 0.49 and ranged between −0.06 and −2.30 D. The 3- and 5-mm Orbscan IIz corneal irregularity indices were greater than 1.50 D in 19 eyes (25%) and 40 eyes (53%), respectively. 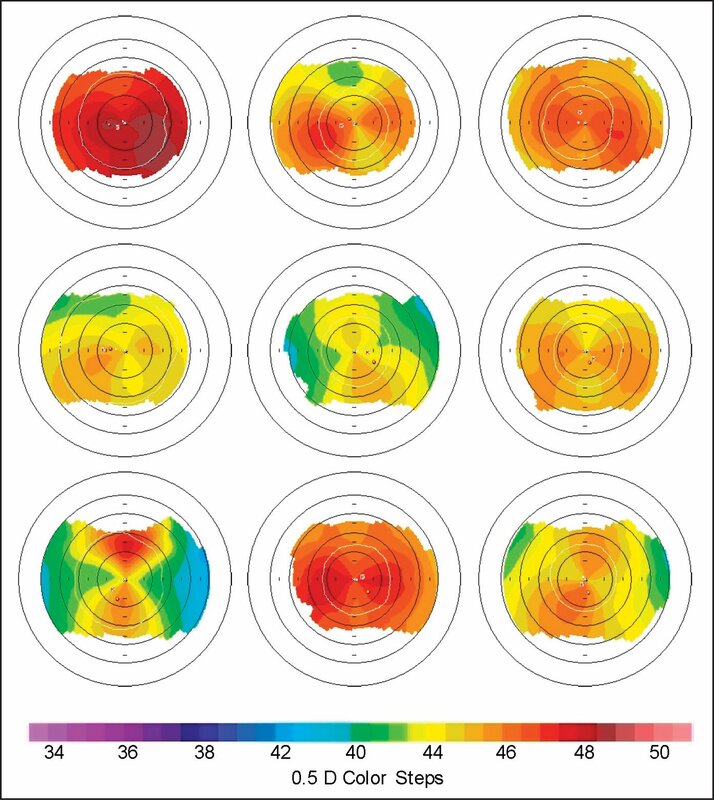 Keratometric maps showing a sampling of eyes with skewed radial axes, non-orthogonal cylinder, and inferior/superior steepening, representing naturally occurring irregular astigmatism. Preoperative and postoperative UDVA was 1.4 ± 0.6 and 0.04 ± 0.06 logMAR (P < .001), respectively. The CDVA was 0.00 ± 0.10 logMAR preoperatively and 0.00 ± 0.03 logMAR (P < .001) postoperatively (Table 1). Cumulative postoperative UDVA was 20/20, 20/25, 20/30, and 20/40 in 78%, 91%, 99%, and 100% of eyes, compared to preoperative CDVA in 83%, 97%, 100%, and 100% of eyes (Figure 1A). Postoperative UDVA was within one line of preoperative CDVA in 94% of the eyes and within two lines in 99% of the eyes (Figure 1B). The efficacy index was 0.98 ± 0.13. (A) Cumulative postoperative Snellen uncorrected distance visual acuity (UDVA) compared with preoperative corrected distance visual acuity (CDVA). (B) Difference in Snellen lines preoperatively and postoperatively compared to preoperative CDVA. Preoperatively and postoperatively, the mean refractive cylinder values were −2.55 ± 0.67 and −0.34 ± 0.32 D (P < .001), with the mean sphere values being −3.13 ± 2.05 and 0.12 ± 0.34 D (P < .001). Preoperative and postoperative SEQ was −4.39 ± 2.07 and −0.05 ± 0.37 D (Table 1; P < .001). The attempted versus achieved SEQ scatterplot revealed an R2 value of 0.99 (Figure 2A). A total of 63%, 88%, 99%, and 100% of eyes had a SEQ within 0.25, 0.50, 0.75, and 1.00 D of target (Figure 2B) and 59%, 81%, 95%, and 99% of eyes were within 0.25, 0.50, 0.75, and 1.00 D of intended plano cylinder. Four eyes (5%) had a residual cylinder of 1.00 D or greater (Figure 2C). (A) Attempted vs achieved spherical equivalent (SEQ), preoperative compared with postoperative. Blue line indicates attempted = achieved, green lines indicate ±0.50 diopters (D), and pink lines indicate ±1.00 D. (B) Intended target preoperatively compared with postoperatively. (C) Refractive astigmatism preoperatively and postoperatively. 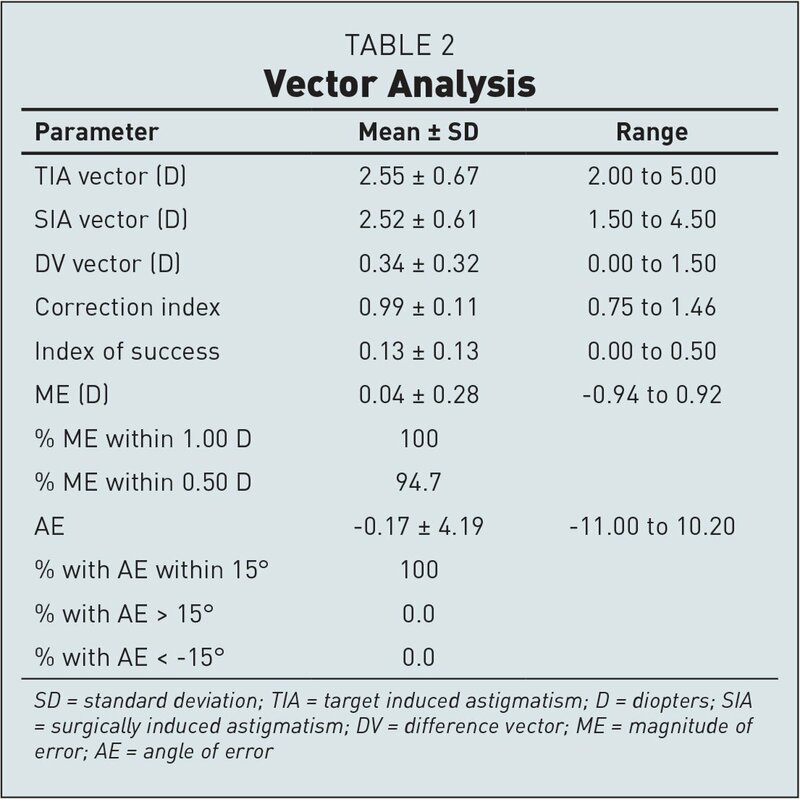 (D) Preoperative target induced astigmatism (TIA) vector vs surgically induced astigmatism (SIA) vector preoperatively and postoperatively. Blue line indicates TIA = SIA, green lines indicate ±0.50 D, and pink lines indicate ±1.00 D (D). 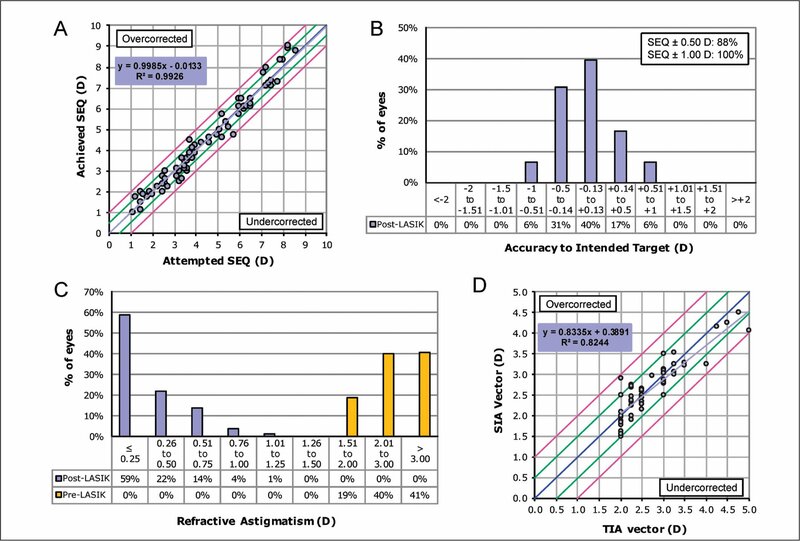 The astigmatism treatment was highly predictable with an R2 value of 0.98 between target induced astigmatism (TIA) and surgically induced astigmatism (SIA) (Figure 3D). The absolute value of SIA (2.54 ± 0.61 D) was not significantly different from the absolute value of TIA (2.55 ± 0.67 D) (P > .05; Figure 3, Table 2), obtaining a correction index of 1.00 ± 0.11 and an index of success of 0.13 ± 0.13. The absolute value of difference vector (DV), magnitude of error (ME), and angle of error (AE) were 0.34 ± 0.32 D, 0.04 ± 0.28 D, and − 0.17°± 4.19°, respectively (Table 2); 100% of the eyes had an angle of error within 15° and 89.5% of the eyes were within 5°. The postoperative residual refractive astigmatism magnitude was mildly correlated with the preoperative 3-mm corneal irregularity index (R = 0.40; P = .0004), preoperative total corneal HOA (R = 0.38; P = .0012), and preoperative subjective refractive astigmatism (R = 0.33; P = .0037). To a lesser extent, postoperative refractive astigmatism was also mildly correlated with the preoperative 5-mm corneal irregularity index (R = 0.28; P = .0162), preoperative corneal coma (R = 0.27; P = .0182), and preoperative ACA (R = 0.27; P = .0205). No significant correlation was found between postoperative refractive astigmatism magnitude and preoperative angle of deviation of skewed radial axes (R = 0.14; P = .2271), preoperative magnitude and axis discrepancy between refractive astigmatism and ACA (R = 0.12; P = .3094), and preoperative ORA (R = 0.06; P = .6198). Analyses of the 14 eyes with residual postoperative refractive astigmatism of −0.75 D or greater revealed that the 3-mm corneal irregularity index, corneal coma, and preoperative cylinder of those eyes were on average elevated by 70%, 60%, and 30%, respectively, compared to eyes that did not have any postoperative refractive astigmatism. Of these eyes, 8 were undercorrected and 6 were overcorrected, with no clear patterns separating them (all P > .05). No eyes had a loss of lines of CDVA, 82% had no change, and 18% gained one line or more of CDVA (Figure 4A). The safety index at the final assessment was 1.04 ± 0.09. Between 1 and 3 months after LASIK, there was no significant change in SEQ (−0.04 ± 0.32 and −0.05 ± 0.37 D, respectively; P = .96; Figure 4B). No eye experienced a SEQ change greater than 0.50 D from 1 to 3 months. Postoperatively, a small but statistically significant increase in root mean square (RMS) total ocular HOA (Zywave; Bausch & Lomb) was observed (0.42 ± 0.18 vs 0.54 ± 0.18 µm; P < .001). Ocular coma (Zywave) was unchanged from 0.26 ± 0.17 to 0.25 ± 0.15 µm (P = .70) and ocular spherical aberration (Zywave) from 0.17 ± 0.14 to 0.28 ± 0.17 µm (P < .001). Total corneal coma (WaveLight Topolyzer VARIO) was similar from 0.48 ± 0.25 to 0.50 ± 0.26 µm (P = .64) and the corneal spherical aberration increased from 0.43 ± 0.23 to 1.09 ± 0.44 µm (P < .001). Orbscan IIz corneal irregularity indices increased from before to after LASIK, within the central 3-mm (1.28 ± 0.50 vs 1.58 ± 0.60; P < .001) and 5-mm (1.62 ± 0.44 vs 2.33 ± 1.89; P = .01; Table 3) corneal areas. Improved subjective uncorrected quality of vision after surgery (Table 4) was found in 97.4% of patients. The average without correction quality of vision grading significantly increased postoperatively (8.9 ± 1.0; n = 76) compared to preoperatively with either spectacles (8.4 ± 1.0, n = 76; P = .016) or contact lenses (6.8 ± 2.4, n = 35; P < .0001). Most patients (97.4%) would repeat and/or recommend surgery to others based on their outcome, whereas 2.6% were unsure, and none said they would not repeat/recommend. Visual phenomena and night vision disturbance frequency, severity, and bothersomeness were either unchanged or significantly improved postoperatively (P > .05) (Table 4). Glare, starburst severity, and bothersomeness were significantly reduced postoperatively, and starbursts were less frequently reported (Table 4; all P < .05). Similar statistically significant improvements were seen in other visual phenomena (Table 4). No significant complications were observed, and no enhancements were performed during the follow-up period. The refractive predictability of topography-guided treatments can decrease when corneal irregularities, measured as anterior corneal HOAs, contribute to pre-operative manifest refraction and are subsequently corrected.3,14 Additionally, large amounts of corneal HOAs produce asymmetric ablation profiles with greater depths, and when added to lower order ablation can induce spherical and cylindrical changes, leading to unexpected refractive outcomes postoperatively. These findings have been reported with therapeutic T-CAT corrections of highly aberrated corneas, flap-related and ablation-related complications, and keratoconus treatments.3,15–17 Eyes with moderate to high astigmatism are naturally more aberrated and irregular, and have been shown to have greater discrepancies between subjective refractive astigmatism and topography-measured ACA.4–6 These eyes with higher cylinder magnitude and greater ORA have also been found to have lesser visual and refractive outcomes.7,8 This study reports on topography-guided treatments in these eyes with higher magnitudes of astigmatism. The FDA trial for T-CAT in myopic and myopic astigmatism eyes1 excluded corneas with asymmetrical bowties and skewed radial axes. Many surgeons base their practice guidelines on similar exclusion criteria and withhold topography-guided technology from these eyes. Yet approximately 40% of normal corneas with ACA have some degree of primary irregular astigmatism on topography,18 and it is these irregular eyes that in theory could preferentially benefit from a topography-guided ablation. In the current study, 37% of eyes had a skewed radial axis with an angle of deviation greater than 10° and 20% had an angle greater than 15°. Additionally, 53% of eyes had a 5-mm corneal irregularity index greater than 1.50 D. Despite this high incidence of naturally occurring irregular astigmatism, 88% and 100% of eyes were within ±0.50 D and ±1.00 D of intended plano SEQ, and 78% of eyes achieved 20/20 UDVA postoperatively, compared to 81% with preoperative CDVA of 20/20. These outcomes are comparable to the subset of eyes with greater than 2.00 D in the FDA study, where 90% and 100% of eyes were within ±0.50 and ±1.00 D of intended plano SEQ and 80% of eyes achieved 20/20 UDVA. Using the iVIS laser platform, Chen et al.19 also published good outcomes of topography-guided transepithelial PRK in eyes with moderate to high astigmatism. They reported an average of 82% and 97% of eyes within ±0.50 and ±1.00 D of intended plano cylinder, which was comparable to 81% and 99% of eyes within ±0.50 and ±1.00 D in the current study. The Alpins' correction index in this study was 1.00, indicating that on average there was no astigmatism undercorrection or overcorrection trend. These data are marginally more accurate than the undercorrected correction index of 0.96 reported with the iVIS platform.19 The Alpins' angle of error in this study was −0.17°, indicating that the mean achieved correction was on the targeted axis, with 100%, 98.7%, and 89.5% of eyes within an angle of error of 15°, 10°, and 5°, respectively. Additionally, 18% of eyes gained one or more lines of CDVA and no eyes lost lines. Considering these excellent outcomes, it is likely that the degree of corneal HOAs in most astigmatic virgin corneas with skewed radial axis and mild asymmetric bowties may not significantly affect the preoperative refractive astigmatism and not be enough to allow the corneal HOA ablation profile to induce a refractive effect, unlike with highly aberrated eyes. The degree of preoperative skewed radial axis did not correlate with postoperative residual astigmatism, further suggesting that there may not be enough corneal irregularity treated to alter refractive predictability. Although additional studies with more eyes are needed, this study suggests that naturally occurring mild irregular anterior corneal astigmatism in virgin eyes should not be used as an exclusion criterion for topography-guided technology. Of note is that the preoperative corneal topography irregularity index and anterior corneal HOAs were mildly correlated to the amount of postoperative residual astigmatism (R = 0.40 and 0.38, respectively; P < .05), indicating that virgin eyes with higher anterior corneal aberrations are somewhat more likely to have residual cylinder. Future studies characterizing topography-guided HOA ablation maps could determine the level of irregularity in virgin eyes at which a treatment-induced clinically significant refractive effect occurs. Such data may allow surgeons to refine patient selection criteria and improve the precision of current nomograms. Both ocular (Zywave) and corneal (WaveLight Topolyzer VARIO) coma did not increase postoperatively, even when including eyes with anterior corneal irregularities. This demonstrates that the ablation was well centered on the corneal vertex and that in theory the T-CAT ablation treated some of the preoperative corneal HOAs. Without a topography-guided ablation, one would expect current symmetrical lower order ablation profiles to worsen preexisting corneal coma postoperatively.20 Studies have shown an increase in total corneal coma after LASIK.21 Another study reported a significant increase in coma after wavefront-optimized (Alcon Laboratories, Inc.) LASIK, but not after T-CAT LASIK, where a non-statistically significant decrease in coma was noted.22 In the current study, T-CAT did not increase average total corneal coma, but it also did not reduce anterior corneal coma from its initial pre-operative average value. Many factors may contribute to these findings. Corneal topographers underestimate coma due to epithelial masking, and therefore the coma is only partially treated.23 There is also the complex interplay of anterior corneal HOAs that are induced by the surgical ablation, posterior corneal and internal HOAs that can manifest after treatment, variable internal compensation of induced corneal HOAs postoperatively, biomechanical shifting of the cornea, and epithelial remodeling secondary to all of these changes. A significant improvement in subjective uncorrected quality of vision postoperatively compared to corrected vision preoperatively was seen in this high astigmatism group. The marked subjective benefit may be attributed to preoperative toric contact lens rotational instability with axis mislocation occurring with blinking and the distortions of high cylinder spectacles, both contributing to reduced quality of vision preoperatively. A decrease in the severity and bothersomeness of night vision disturbances was reported 3 months postoperatively compared to corrected preoperative vision. Nearly all patients in the current study (97.4%) indicated that their quality of vision had improved and that they would repeat and/or recommend the surgery to others. This prospective study used the WaveLight EX500 excimer laser in combination with the T-CAT/Contoura software to specifically investigate outcomes of refractive astigmatism of 2.00 D or greater, and included eyes with naturally occurring irregular astigmatism. Refractive and visual outcomes showed excellent accuracy, efficacy, and safety. There was no increase in corneal coma postoperatively, whereas spherical aberrations were significantly increased. There was a significant improvement in subjective uncorrected quality of vision postoperatively compared to corrected vision preoperatively, with decreased severity and bothersomeness of night vision disturbances postoperatively. The preoperative corneal topography irregularity index, anterior corneal HOA, and magnitude of refractive astigmatism was mildly correlated to postoperative residual astigmatism. These findings show that T-CAT/Contoura software treating on the clinically measured manifest refractive astigmatism axis can be used with good results in virgin corneas with high astigmatism, including those corneas showing naturally occurring irregular astigmatism on topography. Alcon Laboratories, Inc. Adding CONTOURA vision, topography-guided LASIK to the refractive armamentarium. Cataract & Refractive Surgery Today. June2017. https://eyetube.net/collections/contoura-pearls/docs/Alcon%20Insert.pdf. Karimian F, Feizi S, Doozande A. Higher-order aberrations in myopic eyes. J Ophthalmic Vis Res. 2010;5:3–9. Wallerstein A. Primary topography-guided refractive treatments: update, challenges and solutions. Presented at the 2018 Canadian Ophthalmological Society Annual Meeting and Exhibition. ; May 31-June, 2018. ; Toronto, Canada. .
From the Department of Ophthalmology, McGill University, Montreal, Quebec, Canada (AW, MC-C); LASIK MD, Montreal, Quebec, Canada (AW, MG, EA, MC); and the Department of Ophthalmology, University of Sherbrooke, Sherbrooke, Quebec, Canada (MC).